Submitted by Alexander Briones on Dec. 10, 2017. Originally published on Jan. 13, 2016 and most recently updated on Dec 11, 2017 . Powered Speakers, also known as active speakers, are speaker systems with amplifiers built into their enclosures. This configuration allows manufacturers to better match the amplifier with the speaker, resulting in improved fidelity and versatility. This improved quality makes powered speakers more appealing to many musicians and sound engineers, even when considering the extra weight. With so many viable speakers on the market, and many more being released, we have taken another look to see which ones are the current best powered PA speakers. In this update, we reorganized our recommendations into groups by LF (Low Frequency) driver sizes, because different sizes can be better suited to different use cases, you can read more about the effect of different LF driver sizes in the Things to Consider section. NB: We are presenting the Continuous Power ratings as the headline rating instead of Peak Power as used by some manufacturers because Continuous is more indicative of how they perform in most real-world situations. Because of their compact diameter, 8" LF Drivers (also called woofers) have limited low-end response. But in exchange they offer great middle and treble clarity. They can also be housed in smaller cabinets making many of them popular as stage monitors. These speakers are ideal for use with vocals, acoustic guitars, and other instruments that do not require a lot of bass. 93 out of 100. Incorporating 40+ ratings and reviews. 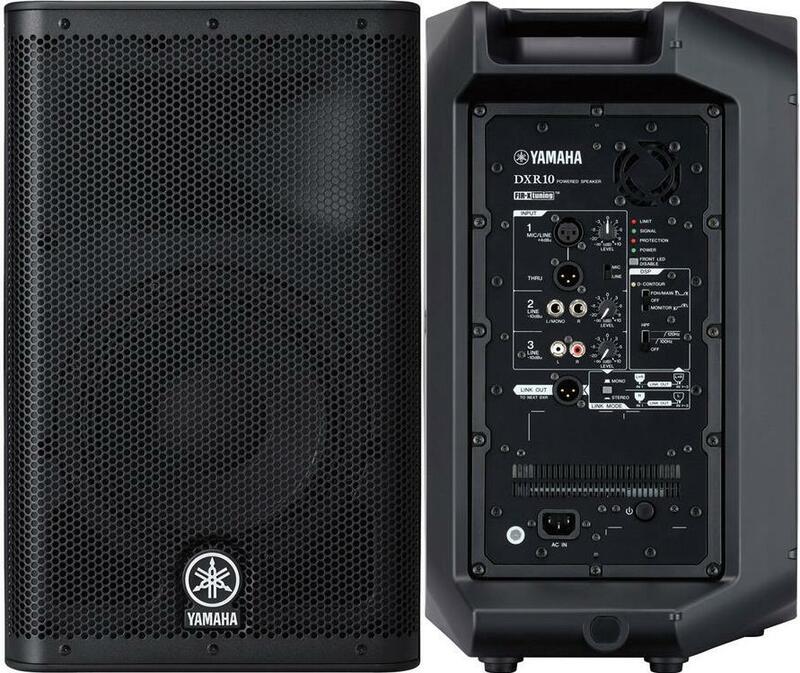 With its 700W RMS (1100W Peak) amplifier, the Yamaha DXR8 can get really loud for its size. But it's not just about being loud, because the extra headroom allows for better reproduction of audio nuances and dynamics. What makes it even more appealing is how relatively light it is for what it can do, thanks to its lightweight Class D amplifier and ABS thermoplastic enclosure. This active speaker is equipped with an 8" woofer and a 1.4" tweeter, and features Yamaha's FIR-X tuning technology, which optimizes the combination of the two drivers. Finally, since it has a built-in mixer with dedicated level knobs for each of its three inputs, the Yamaha DXR8 can double as a portable PA system if the need arises. Dimensions: 11" x 18" x 11"
The Yamaha DXR8 is loved by many because of its good balance of sound quality and portability. Many are surprised at how loud it can be, while retaining the characteristic crisp sound provided for by smaller 8" speakers. It also helps that its build quality is top notch. Good reports continue to pour in from mobile DJs, musicians, sound technicians, event organizers, and even from those who simply want to listen to music at home. As a testament to how good it is, there aren't any noteworthy complaints other than a few shipping issues, which are unrelated to the speaker's quality. 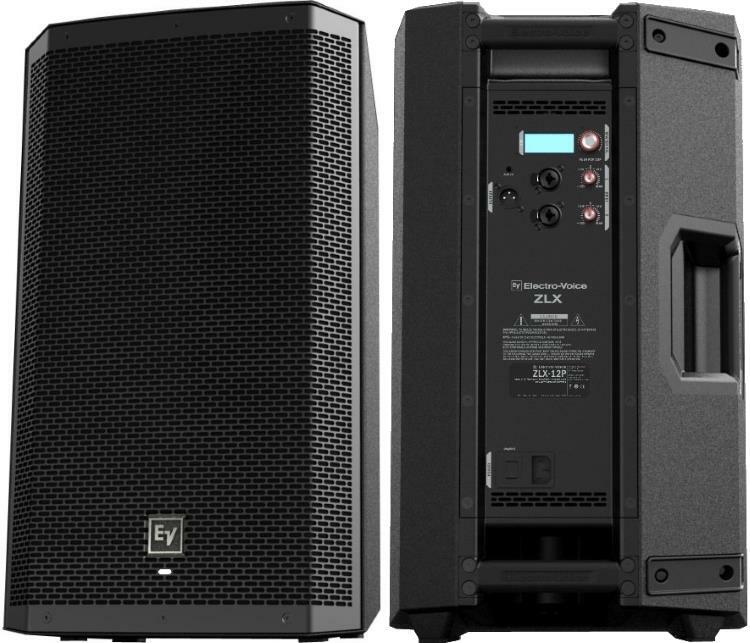 If you're looking for a compact powered PA speaker that can double as a portable PA system, then the Yamaha DXR8 is highly recommended. 94 out of 100. Incorporating 50+ ratings and reviews. The K8.2 is part of QSC's updated line of K.2 series speakers, carrying over the same quality and standards as the popular original K series, with notable improvements. Changes include increased power to the LF driver (by taking some away from the HF driver where it's less needed), max SPL (Sound Pressure Level) and improved low-frequency extension, all of which add even more value to the original K8's design. To be specific, the K8.2's extended bass allows its smaller 8" LF driver to pump more bass, without compromising its midrange clarity. Another important feature of this speaker is its built-in DSP, which lets you customize or use built-in presets, for quick fine tuning to match venues and sound sources. Finally, the K8.2 is light and comes with a 3-input mixer that allows for portable PA system functionality. Dimensions: 17.7" × 11" × 10.6"
The general sentiment is positive, with many users describing the speaker as great sounding and remarkable. Many are impressed with its clear midrange, including guitarists who use it in conjunction with modern guitar processors in place of a traditional guitar amp. It is also reported to work well for singers, speaking engagements and other events. DJs who pair the QSC K8.2 with a subwoofer have also found its performance to be exemplary. There were a few who found the volume to be lacking, but it appears to have been used in big / open air venues in those cases. 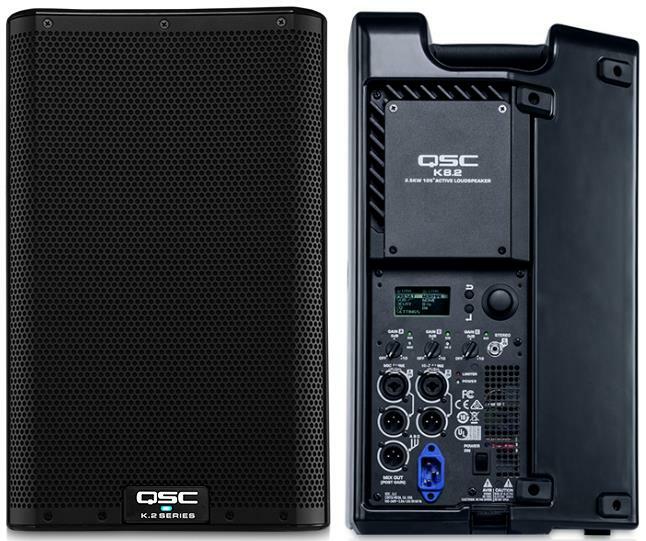 With its quality and portability, the QSC K8.2 is very easy to recommend. Speakers with 10" woofers have more low-end than their 8" counterparts. They generally have enough volume to handle small venues, but may still be lacking bottom end for certain bass heavy musical styles. You'll find these speakers used in many small indoor venues. 96 out of 100. Incorporating 150+ ratings and reviews. The DXR10 sits in the sweetspot where portability, sound quality and power meets, carrying over the same features as the bigger DXR Series speakers from Yamaha, albeit with a smaller 10" woofer, compact cabinet frame, and lighter weight. Weighing in at just 32.2 lbs, the DXR10 is capable of pumping more low end than you'd expect for its size - showcasing Yamaha's impressive ability to provide market leading quality and features without jacking up the price tag. It comes equipped with a 700W (Continuous) amplifier and DSP FIR-X tuning technology for phase optimization. In addition, it also sports a built-in 3-channel mixer that makes it a viable samll PA system, complementing its portable profile. Dimensions: 19.75" × 12" × 12.25"
Warm and portable are two descriptive words that summarizes what the market feels about the Yamaha DXR10. Users from various musical backgrounds were impressed by its warm sound, including musicians who use this speaker in conjunction with their keyboards or electric guitar rig. In addition to sounding nice, many consider the weight to power ratio to be just right for mobile use. There were a few users found the DXR10's bass to be lacking, but other than that, most users have nothing but good words for it. If you are looking for a portable, reliable and great sounding 10" powered speaker, then check out the Yamaha DXR10. 95 out of 100. Incorporating 100+ ratings and reviews. The DBR series from Yamaha is designed to give us more options in the portable powered speaker market. And it looks like they hit the jackpot with the DBR10, because it continues to rake in positive reviews from DJs, musicians, sound engineers and many more. For a speaker with 10" woofer, the DBR10 is loud, but more importantly it is incredibly light for what it can do at just 23.2 lbs! This makes it ideal for performers who have to carry their own PA equipment. Interestingly, many of the features found in the more expensive DXR series are available in the DBR series, albeit with less output power. In particular, the DBR10 features Yamaha's DSP based FIR-X crossover tuning, D-Contour controls, and onboard mixer (2-channel). Dimensions: 19.4" x 12.1" x 11.4"
Many were impressed by how loud the DBR10 is, especially when considering its weight and size. Reviews report that it works great as Front of House loudspeaker for small to medium size venues. But it's not limited to just FOH duties, because musicians found it to be ideal for personal monitor use be it for amp modelers, electric drums, keyboards and more. There were some who complained that the ABS plastic exterior is a not as scratch/ding resistant as they expected, but no consistent complaints other than that. If you want nothing less than the best powered PA speaker in the sub $500 price range, then get the Yamaha DBR10. If you're looking for more low-end punch, then this is the section that you should look into. 12" woofers are preferred by many for their balanced overall sound, they are widely used in cafes, bars, gardens, and even places of worship. They are a bit bulky, but are still reasonably portable. 94 out of 100. Incorporating 125+ ratings and reviews. The Yamaha DXR12 is the bigger sibling of the DXR8, featuring the same amplifier section, controls and input/output selection, with the main difference being its bigger 12" woofer. Consequently, the enclosure is bigger and the overall weight is a bit heavier, which results in a slightly more emphasized bottom end when compared with its smaller sibling. The same Class D amplifier is used, along with Yamaha's DSP FIR-X tuning technology which dynamically optimizes the time alignment between the tweeter and the woofer. Other features include a built-in 3-channel mixer, D-Contour and HPF switching. Dimensions: 23.5" × 14.25" × 13.75"
Market sentiment is overwhelmingly positive, with users and experts alike giving the DXR12 top marks for its great balance of quality and value for money. A good number of musicians pointed to its clarity, even at high volumes, as its best trait. Durability and the flexibility of having 3 channels also made this an easy pick for musicians who are looking for an all-in-one powered speaker solution. There were a few that wished for better handle positioning, while others cautioned that the DXR12 is quite heavy. On the plus side, there are no notable complaints about Yamaha DXR12's sound and build quality. Check out the Yamaha DXR12 if you are in the market for a reliable and good value 12" powered speaker. 93 out of 100. Incorporating 700+ ratings and reviews. The most noteworthy feature of the Electro-Voice ZLX-12P is its versatile built-in DSP, which lets you tune your speaker for different applications via manual EQ or by using Mode and Location presets. It also has a built in DSP limiter and crossover presets for better pairing with subwoofers. This digital brain controls the ZLX-12P's hardware components which include a 500W (Continuous RMS) amplifier, a 12" woofer and a 1.5" titanium compression driver, all of which work together to provide a versatile solution for various venues and events. Max SPL is 126dB, so these speakers are not meant to handle bigger venues by themselves. Dimensions: 24" × 14" × 14"
From FOH tops for small venues, to floor monitors for bigger ones, many consider the ZLX-12P to be flexible and reliable. Even those who were skeptical found themselves liking the performance of this speaker after giving it a try. Its clear sound and solid build were well received, a true workhorse loudspeaker that's budget friendly. There were a few who recommend careful handling because that the exterior is easy to scratch. While this speaker is a bit heavy at 34.3 lbs, it still is not the heaviest among other 12" active speakers. 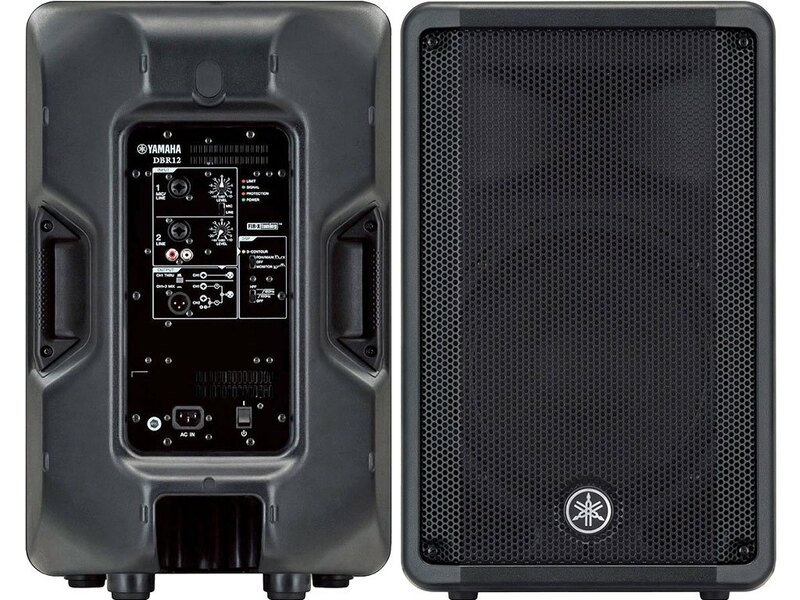 If you're looking for a great bang per buck powered speaker that can handle different venues then do check out the Elevtro-Voice ZLX-12P. 93 out of 100. Incorporating 100+ ratings and reviews. The loudest member of the QSC K.2 Series is a tad bit louder than its predecessor, with a max SPL of 132 dB. Other K.2 Series changes apply, including improved power distribution efficiency, better DSP controls via LCD, user adjustable crossover, and improved floor wedge angle. This means that the well received K12 just got better, while carrying over the same top notch build and sound quality that people have come to expect from its predecessor. With its 12" woofer, you can expect a fuller sound with more low end, but it is still compatible with sub-woofers, thanks to its user adjustable crossover frequency. Dimensions: 23.7" × 14" × 14"
One user aptly put it, "QSC has outdone themselves" with the K12.2. Reviews are full of commendations from users who are impressed with its overall performance. With many reporting that it works well with mobile DJ setups, full band setups, conferences, weddings and other events. Its solid build also got a lot of thumbs up from experienced users who are very happy with how solid and durable the K12.2 feels. Of the few complaints it currently has, nothing stands out, other than a few comments from those who find the price to be a bit steep. If you're looking for QSC's clarity and punch, and you want one with more bass, then get the QSC K12.2. 91 out of 100. Incorporating 225+ ratings and reviews. 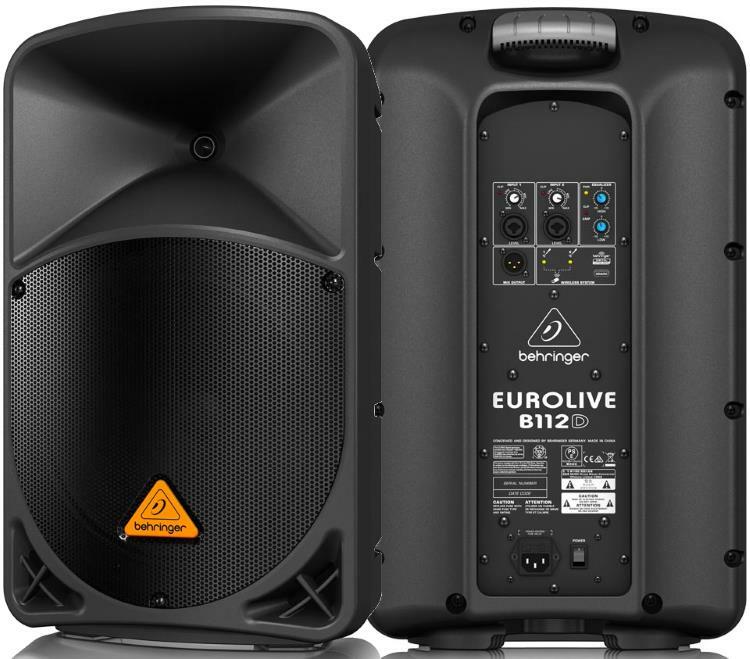 The Eurolive B112D is a testament to Behringer's improving quality and continued popularity, convincing even critics that affordable doesn't always mean compromised quality. This speaker features a 12" woofer and a 1.35" tweeter, bi-amped by the 1000W (Peak) built-in amplifier, and everything is crammed into a light but sturdy plastic enclosure. Other features include 2-band EQ control, integrated DSP for speaker protection, and integrated mixer. Compatibility with Behringer's Ultralink ULM wireless systems add to the already good value for money that this speaker brings to the table. Controls: Power Switch, Input 1 & 2 Knobs, High and Low EQ Knobs, Wireless Compatibility. Dimensions: 22.4" × 13.4" × 10.6"
* Behringer are yet to respond to our request for information. Reviews are consistent in saying that this speaker sounds really excellent, especially for the price. Some even report that they've been using it for many regular gigs without fail. While there are still a few who say that quality still needs improvement, they are now vastly outnumbered by positive reviews from musicians, DJs and other users. Weighing in at just 27.1 lbs, this powered speaker is easy to carry around, but there are some concerns over its durability. Still this is something that proper handling should be able to address, and its not like these speakers will easily break, because some reviewers have used them for years without fail. If you're looking for a budget friendly 12" powered speaker for your instrument or for your PA, the B112D is the way to go. 15" speakers have the most low-end, with the obvious drawback of being bulky and heavy. 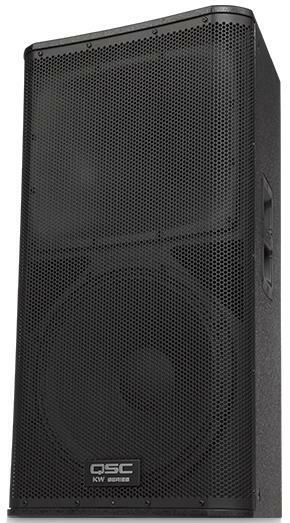 These are mostly used in bigger venues, preferred by DJs and event organizers who are looking for speakers that can handle low-end thump. Rock bands who are looking for a fuller sound when performing live will also appreciate the punchy bass that these speakers provide. 95 out of 100. Incorporating 125+ ratings and reviews. Yamaha's reputation for quality and value for money is applied to most, if not all, their products, including their active PA speakers which continue to dominate the market. The top rated Yamaha DXR15 powered showcases why Yamaha continues to be at the forefront - combining good features with impeccable quality, while retaining an appealing price tag. As the name implies, this one houses a bigger 15" woofer, which allows for more bottom end emphasis. The woofer is paired with a 1.4" high frequency driver, and both are powered by 700W (Continuous) Bi-Amp configured amplifier. The DXR15 can go up to 133dB SPL, which is louder than others in the same price range. And since it can be positioned on the floor or on stands, this loud PA speaker is easy to add into existing setups. It also comes with a 3-channel mixer, which makes it a viable portable PA system by itself, handling up to three instruments/mics. Note that the DXR15 is quite heavy at 49.6 lbs, so you'll want to look for something smaller if you want something that's easier to move around. Dimensions: 27.5" × 17.5" × 15"
DJs, Electronic musicians and even bands find the DXR15's expanded low frequency to be more than satisfactory. The clarity of its low end, even when driven hard, exceeded the expectations of many. Almost all reviewers agree that this speaker is really loud, allowing some bands and DJs to perform without the need for a dedicated subwoofer. There's not much to complain about other than it's expected bulk and weight, and this is reflected in a few reviews. 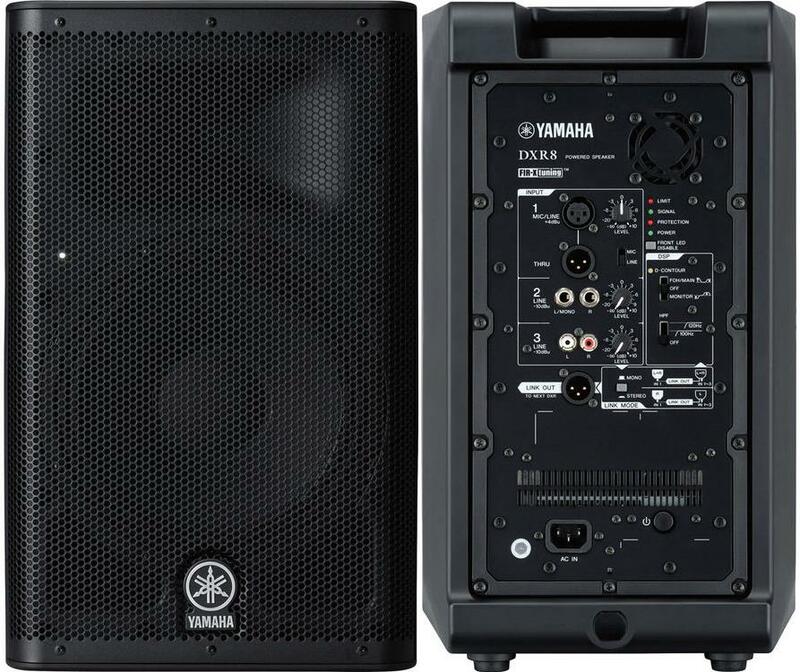 If you're looking for a versatile powered speaker with more volume and bottom end, the Yamaha DXR15 is your best pick. 95 out of 100. Incorporating 70+ ratings and reviews. 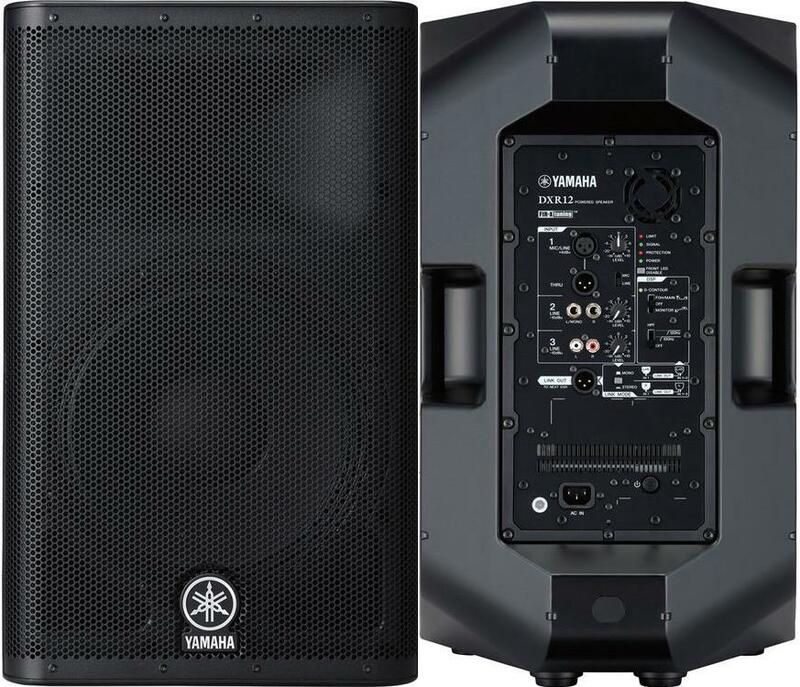 The Yamaha DSR115 is a powered active speaker that's meant to handle bigger venues with its 1500W (Dynamic) power rating, 15" woofer and 2" tweeter. And since it has big woofers, it can reproduce deep low-end frequencies without any problems, and you don't have to worry about overloading the speaker because it comes with built-in DSP limiter. Speaking of DSP, it comes with Yamaha's D-Contour technology, which constantly monitors and adjusts frequencies for optimal sound quality. This allows the DSR115 to sound good regardless of volume level. Finally, it is housed in coated wood enclosure, which provides solid protection, at the cost of being quite heavy. Inputs: 1 x XLR, 1 x 1/4"
Dimensions: 29.75" × 16.6" × 17.4"
Excellent and awesome are just two of the many positive adjectives that have been used to describe the Yamaha DSR115. Most of its high ratings are attributed to its low-end punch and overall volume, while others also appreciate its clarity. Reliability is also one of its strong points, as attested to by users who reported using the speakers for extended periods without any problems. Aside from its expected bulk and weight, we didn't find any stand-out concerns that should be mentioned here. 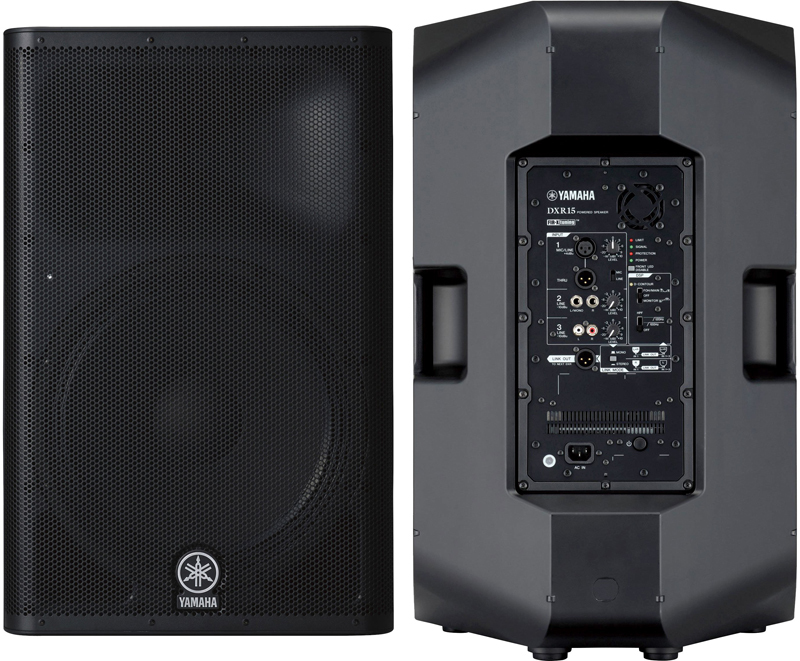 All in all, the Yamaha DSR115 is a true workhorse powered PA system, ideal for use in medium to big venues. 90 out of 100. Incorporating 375+ ratings and reviews. 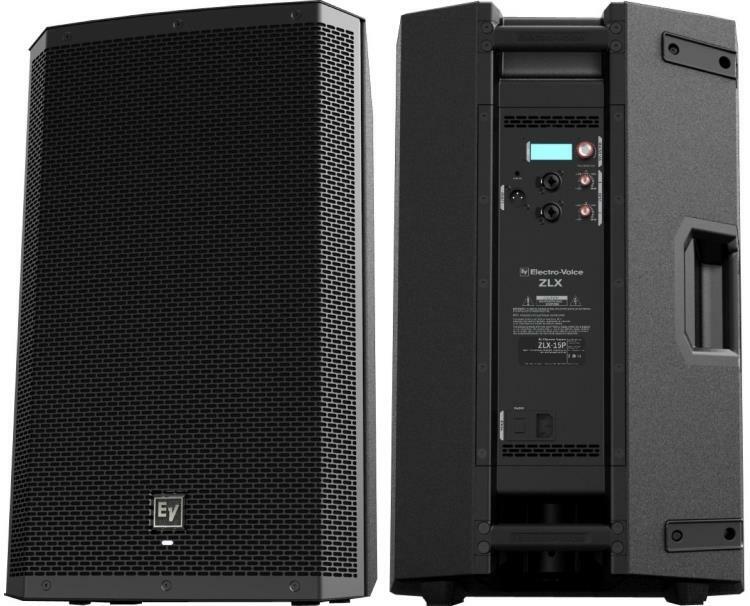 The Electro-Voice ZLX-15P gives you quality sound reinforcement with more oomph at a reasonable price point. Priced at $100 more than the 12" model, the extra cost is justified by its extended low end, thanks to its 15" woofer. This bigger woofer is paired with the same 1.5" high frequency titanium compression driver and 500 Watt (Continuous RMS) Bi-amplifier. Combining all the features together makes for a bulky and heavy speaker at 42 lbs, but it is an expected inconvenience that many DJs and electronic musicians are willing to accept. The same DSP features are available, including mode and location presets, limiter and built-in EQ. Dimensions: 27" × 17" × 15"
More and more users add to the ZLX-15P's ever growing list of satisfied customers, most of them stating that it is a great value loud speaker, especially for those who need more bottom end, without having to resort to a subwoofer. And it's not just DJs and EDM musicians, because it also got a lot of thumbs up from bands and singing groups. One of the few concerns about this speaker is its lack of output volume (max SPL of just 127dB), especially when considering its size. Ironically, a some commented that the limiter is protecting the speaker too much, resulting in actual output reduction at times. If you're looking for an affordable speaker that reproduces good low end for small venues, then you'll want to consider this one. These are premium 15" speakers meant for medium to big venue use. Check these out if you want to get the best of what this price range has to offer. 97 out of 100. Incorporating 100+ ratings and reviews. More QSC Speakers flood into this list, one of which, the QSC KW153 even gets the highest rating among all the speakers in the sub $1500 at the time of publishing. And it's not surprising because this three way powered loudspeaker can get really low and loud, while still retaining the sound quality expected from QSC. It features a 1000W (Continuous RMS) amplifier that drives a 15" LF driver, a 6.6" MF (Middle Frequency) Driver and a 1.75" tweeter, all of which converge nicely thanks to combination of great DSP and projection. Being big and loud has its obvious drawbacks, which is its bulk and weight, but this is to be expected when you're looking for more volume or a more permanent installation. Dimensions: 43.1" × 18.5" × 16.8"
Market response to the QSC KW153 is overwhelmingly positive, pointing to its sound quality and reliability as its stand out features. Users from various backgrounds chimed in with their commendations, including professional musicians, DJs, event organizers, sound technicians and more. There was one who even commended this speaker for being good at reproducing classical style music, a testament to its clarity and incredible sonic detail. There really aren't any repeating complaints about this speaker, aside from a few who experienced shipping issues. If you're looking for the highest rated powered PA speaker that you can buy for less than $1500, then get the QSC KW153. 93 out of 100. Incorporating 50+ ratings and reviews. The QSC KW152 carries over most of the same features of its bigger sibling, the KW153, but with a two-way configuration and a smaller profile with no MF (Middle Frequency) driver. With its 15" woofer, you get extended low end that can handle most musical applications, while the 1000W (Continuous RMS) amplifier is more than enough to handle medium to big size venues. Dimensions: 32.1" × 17.5" × 15.2"
Coverage and sound quality are two of the most prominently commended traits of the QSC KW152. Many are simply amazed at how its low end does not muddy the sound, while others are happy with how a pair of KW152s can fill venues of different sizes. Ease of use is also mentioned by users who were surprised at how easy it is to make the speaker sound good. There are a number of keyboardists who use this speaker as their keyboard amp, and they are very happy with its performance. There was one user who commented that the dispersion angle is a bit narrow, but this will not be much of an issue with proper positioning and venue planning. If you're looking for a powerful 2-way powered speaker that's a bit more portable than the KW153, then get this one. 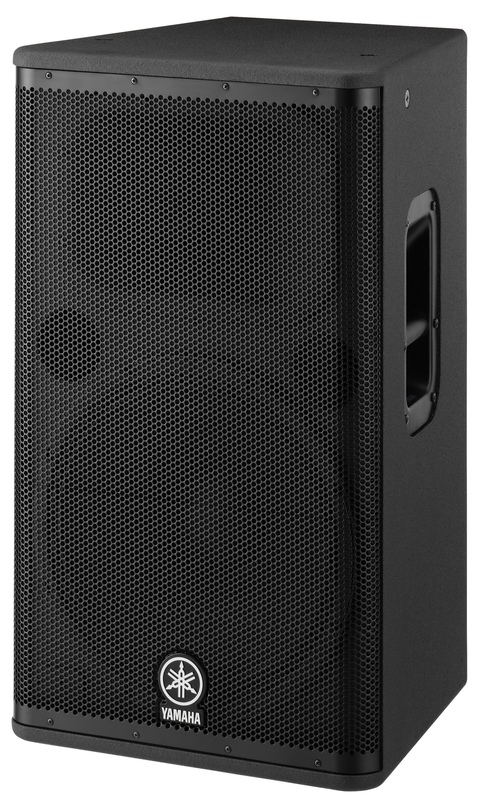 Line array speakers are becoming more and more in demand, case in point is the popularity of the Bose F1 Model 812. Instead of the usual 2-way or 3-way configurations, this speaker features 8 x 2.25" speaker cones that are vertically aligned, tasked to reproduce the middle and higher frequencies. At the back of this array is a 12" woofer that complements the sound of the array. Another standout feature of the F1 Model 812 is its multi-pattern array structure, its lets you adjust the structure of the array to better match the position of your audience. The speaker's built-in DSP also helps make the necessary EQ adjustments to complement the changes. All of this add up to a improved flexibility when it comes to where you will put the speaker. Dimensions: 26.1" × 13.1" × 14.6"
Market outlook for the Bose F1 Model 812 is convincingly positive, with many reporting being blown away by its clarity, flexibility and easy implementation. It continues to receive five star ratings from vocalists, event hosts, DJs, acoustic guitarists, keyboardists, other musicians, and many more. Some have even reported getting great results in outdoor venues, praising the speaker for its clear and full sound. There are no standout concerns about the speaker, just note that the downside to its array structure and multiple speaker design is that it has a number of moving parts - which means more chances of having problems in the long term. So like all electronic devices, proper handling and storage is imperative to avoid any issues. 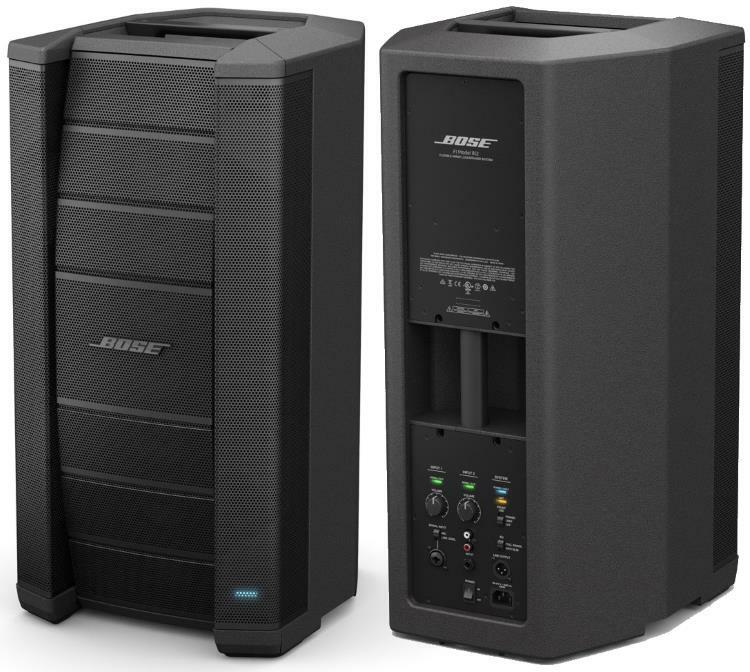 Get the Bose F1 Model 812 if you're looking for a versatile premium quality powered PA speaker. The speaker cone size refers to the size of the LF (Low Frequency) Driver. Ideally, smaller woofers tend to emphasize the mids, while bigger ones offer more bass. Compact 8" loudspeakers work particularly well with sound sources that are not bass heavy, like vocals and guitars. As you add more bass heavy instruments into the signal chain, like keyboards, bass guitars and drums, you'll need bigger speaker sizes. 10" to 12" should be enough for most small group/band settings. On the other hand DJs and Electronic Music enthusiasts prefer bigger 15" speakers for the extra low end they provide. If you are looking for more low end, you can consider getting a PA subwoofer or two. Since powered speakers have built-in amplifiers, you don't have to worry about properly matching the speaker to the amp like you would if you opted for passive speakers. So what we have to focus on is output power, which is a numerical representation of the speaker's headroom and projection. There are two types of power output ratings that are commonly listed by manufacturers and retailers: Continuous (RMS) and Peak (Dynamic). Continuous (sometimes interchanged with RMS) is the better representation of how powerful a speaker really is, because it specifies the wattage in which it can operate safely for long periods. Peak (sometimes interchanged with Dynamic) refers to volume/power bursts that speakers can handle, it points to the upper limit of what speakers can do and as such is not a good standard to use. 200 to 500 Watts of Continuous power should be enough for most small venues, while upwards of 500W are meant for medium to large size venues. Max SPL (Sound Pressure Level) is also an important factor to consider when it comes matching speakers with venue size. The general rule is that higher the max SPL rating, the more space is covered by the speaker. Note that you can implement multiple speakers in strategic positions for covering larger venues. The built-in amplifier found inside powered speakers add weight and some bulk, as such they are generally heavier than passive speakers. So it's important to consider weight and portability features, especially when you change venues regularly. Important features like handle location and size should be taken into consideration, you don't want to end up buying a great sounding speaker that you can't carry around, or you can't fit inside your vehicle. Many powered speakers come with built-in DSP (Digital Signal Processors), and that provides various advantages that include smart limiters to protect the speaker from overload/clipping. Some even use DSP to tweak the sound to match the acoustics of rooms, allowing for more versatile placements. While it's better to do EQ adjustments on the mixing console, making adjustments at the speakers can be handy in certain situations and venues. Some powered speakers can handle two or more inputs and have dedicated gain/volume controls, much like a mixer. These speakers can double as a standalone mobile PA system for solo performers and singer songwriters who play in smaller venues. The more components a device has, the risks of having problems increases, and in that sense, Passive speakers are more durable. Still, modern build quality continues to improve, so much so that reliability is not much of a concern when it comes to powered speakers. Still, regardless of how solid the exterior is, there's no substitute for careful handling and transport. We looked at top rated powered PA Speakers that are available from major US retailers. At first we limited our scope within the $1000 price range, but we decided to include those up to $1,500 as a result of feedback from our readers. This resulted in expanding our database from 40 to over 60 powered PA speakers, which meant gathering over 7,300 reviews, ratings and recommendations, and processing all of them via the Gearank Algorithm. We then used the resulting scores to rank them based on their LF driver speaker cone size, and only the highest rated of them are featured in our recommended list. As always, we've included detailed descriptions and specifications for each powered speaker, along with their strengths and weaknesses as reported by actual users. For more information about this process see How Gearank Works. If you feel there is a speaker that we should be recommending above, first check to see if it's in our Music Gear Database, then if you can't find it there, let us know in the comments below that you would like us to consider including it. Submitted by Adrian (not verified) on Jan. 13, 2016. My band has been using both EVs and JBLs for years now and they're both really good powered speakers. Why didn't you include JBL on your list? Submitted by Jason Horton on Jan. 13, 2016. We did take a look at several JBL systems but none of the scored a high enough Gearank to be included in this gear guide. Submitted by Anonymous (not verified) on May. 24, 2016. I'm disappointed with this list. I'm surprised that Mackie's were cited as being "reliable." I had a pair of Thumps that were anything but reliable. I had to replace them after six months of use. JBLs are known for reliability, not Mackies. Submitted by Jason Horton on May. 24, 2016. The Gearank scores are based upon customer feedback and expert reviews of the latest models. Here are the JBLs we processed and none of them had enough positive feedback to score high enough to be included. If you think there is a current JBL model we should process for a Gearank score to see if it should be included, then please let us know. Submitted by Christian Che (not verified) on Jul. 26, 2016. I have had JBL PRX625 now for almost four years and they are really good, never had problems with them. Just bought Bose F1 system two months ago and had two sub woofer rattling. JBL deserve to be on this list. Submitted by Jason Horton on Jul. 26, 2016. The JBL PRX625 speakers are no longer available to buy from most of the major North American retailers which is why this specific model was not included. BTW - although JBL didn't score high enough to be included in this guide, they topped the ratings in our guide to the Best PA Subwoofers. Submitted by Ben (not verified) on Sep. 3, 2016. Submitted by JOBLO (not verified) on Nov. 2, 2017. I had a pair of PRX615's the bass was good the horn was crap so that's probably why they didn't get a mention a lot JBL speakers have a funny midrange and top end most DJ's don't notice this but put one up against something like the RCF 700 series and the FBT VENTIS/PROMAXX and you'll notice the difference. Submitted by Walt (not verified) on Sep. 24, 2017. You tested the entry level jbl gear.... how about srx etc? Submitted by Jason Horton on Sep. 25, 2017. We don't directly test any of the gear on this website - the entire point of Gearank is that we base our ratings on reviews and comments made by musicians from around the world - that's what the "Sources" and "Incorporating (x)+ ratings and reviews." numbers reflect. To get a better handle on this please read How Gearank Works. Submitted by John Alfieri (not verified) on Feb. 13, 2016. Submitted by Jason Horton on Feb. 15, 2016. Thanks John - you were quite right that we were trying to stick to a price range, we didn't want go much over $1,000. If we had gone up to $1,500 the the QSC KW153 would have been in the list too. Submitted by seleckta (not verified) on Aug. 20, 2016. Would you help me compare the two EV and JBL? What is the best choice in durability, audibility among others? Submitted by Jason Horton on Aug. 20, 2016. We have 4 JBLs and 4 EVs currently in our public database. If you click on those links you'll see that the EVs generally have higher Gearank scores than the JBLs - this means people who have bought the EVs are more satisfied with their gear than the people who got the JBLs instead. That's why we recommended the ZLX-12P & ZLX-15P EVs above but have not done so for the JBLs at this stage. the Ev speakers seems to be much heavier in their performance would you pliz high lighten on the ratio of Amp to speakers in terms of there watts. Submitted by david (not verified) on Oct. 25, 2016. Being a sound engineer, Jbl's used to use quality components back 20 years ago but what they are putting out now is not professional grade products. I have qsc153 they are a bit on the heavier side but in terms of professional sound reinforcement they cannot be beat! It comes down to what is your main concern when performing live, quality professional products or products that fit your budget. I prefer to wait when making a purchase but get a product that is top notch! Submitted by Mike (not verified) on Dec. 30, 2016. I build Adamson speakers and they are great build with kevlar drivers great outside in all wether but you will pay. Submitted by des preston (not verified) on Mar. 23, 2017. JBL has never been a good speaker EV beats them hands down are you deaf? Submitted by Eric (not verified) on Mar. 28, 2017. I listened to JBL and EV side by side and chose the EV Live X series. EV beat JBL hands down. Submitted by Brian (not verified) on Apr. 5, 2016. Was RCF out of the price range? The RCF Art series are definitely within the price range, however they have limited availability in the US - you usually have to buy them on special order. Submitted by Mango (not verified) on Aug. 7, 2016. No offense. RCF Art series is garbage just like the JBL PRX. Sounds like radio amplified. Good that its not listed here. If you want noise then it is, not for music. Submitted by Beesuit (not verified) on Sep. 19, 2016. You've clearly not heard RCF's ART 745-A. It's easily one of the best loudspeakers in its price range. Actually, considering its price, it probably is the best bar none. With its huge 4" driver, there's little competition for it if small-mid range venues is your thing. Clearly you haven't done any testing or comparisons the new series IIII 700 series sound very good and most italian companies make great speakers like FBT & DB youre talking through your hat. Submitted by R. Glenn (not verified) on Apr. 15, 2016. Submitted by Jason Horton on Apr. 15, 2016. A subwoofer guide is a good idea - I'll add that to our list of topics to investigate. Submitted by Jason Horton on May. 25, 2016. Submitted by CarlMal (not verified) on May. 2, 2016. Submitted by tom (not verified) on May. 10, 2016. How would these speakers compare to some old ev s200s in low end punch? Submitted by Jason Horton on May. 11, 2016. I haven't personally used the EV s200s, however they have 12" woofers so you'd expect any modern 15" speaker to have a stronger bottom end. Submitted by Manny Tello (not verified) on May. 19, 2016. Hey im looking for a speaker to play my music in my room. I'm looking for one speaker I will buy a second one once I save up. I just want the best clear nice bass audio really debating on getting the DRb10 or a Behringer B112w which is the Bluetooth version of the B112d or even the turbo that your sound editor picked. I don't know if should get the Behringer or loose the Bluetooth for the Yamaha. Do you think the sound on the Yamaha is better in clearness and deep bass or should I just get the bigger 12 in Behringer for louder sound and deeper bass. And again this is going in my room will the 12 in be too much for my room? If it is there's no point in getting another 12 inch to make it a pair so I don't know if i should get 2 10 or one 12 or maybe even just one 10 which would be the Yamaha. I will be playing music and movies, video games and I could just lower the volume but I don't wanna loose too much sound quality so bottom line bigger speaker or smaller speaker? Remember I won't be playing them too loud. Please and advise or help on what too choose I been debating for a while now and your post really helped give me an idea. You guys are awesome thanks so much. Given that you're just going to be using this in your room I'd suggest the Behringer B112w would be just fine - it also has a built in 2 channel mixer. Don't forget that if you want stereo then you'll need 2 speakers. Submitted by Austin (not verified) on May. 25, 2016. How would u compare/rate the Bose L1S with B2 bass unit, I know they r expensive but are they as powerful as the above listed brands? I also hear of the Fender Passport Venue Speakers. Any feedback? Would appreciate ur advise, as I'm thoroughly confused. cheers! Submitted by Alexander Briones on May. 29, 2016. 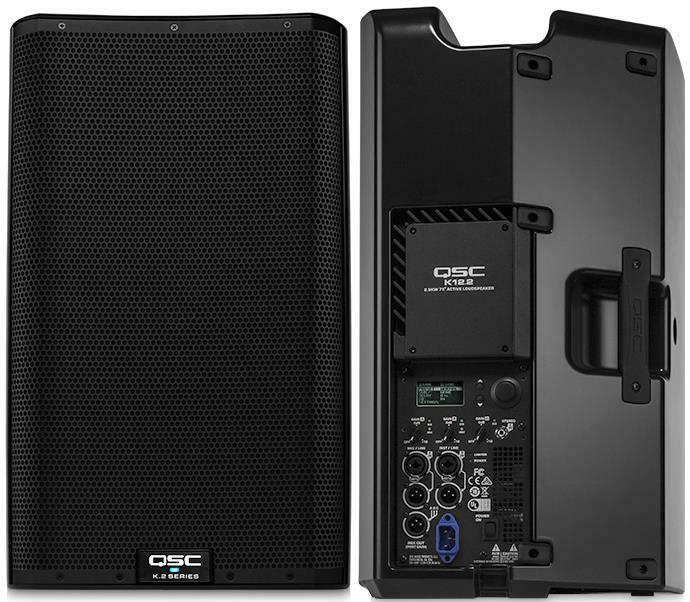 The QSC K12 is highly recommended, with its proven acoustic and vocal friendly sound. Based on ratings, the QSC K12 trumps the JBL EON615, so that's an easy pick right there, especially in your case where the speaker needs to be of high quality and easier to carry around. The Fender Passport Venue is definitely worth considering, given its portability and built-in mixer features, in case the father of the bride (or the entire family) wants to sing with you. The only downside is that it may not be enough for bigger open space venues. Submitted by Anonymous (not verified) on Jun. 24, 2016. I would like to recommend the Cerwin Vega P-Series. I have 16 subs, 6 x 15'' tops & 4 x 10'' tops. I also have for Yamaha DXR 8's which is why I am writing this comment. The best thing about the Cerwin Vega's other than the sound is the front light limiter fo me. The sound is incredible, much better that the electro voice and Yamaha's. Yamaha's cannot be used without the high pass filter switch set in the middle setting and when it is turned off it doesn't sound good at all. The PX1000 wipes the floor with yamaha for sound quality. The subs I have never yet had a problem with them for the 3 years I baught them other than fans breaking and changing them. I have had problems with 2 15" tops and no problems with the 10" tops but they are just 1 year old. The tops woofer didn't work on 2 occasions and needed to be sent in for service. Not sure what the problem was as I just send them to the shop for repair and they came back working again. Only bad thing about the subs is the handles are awkward on the wrist when lifting with 2 people. I haven't heard the Bose or QSC but I've never been a fan of Bose speakers. I know that the P-Series is much much better than some of the speakers you have chose as your top 10. Submitted by Alexander Briones on Jul. 13, 2016. We appreciate your personal recommendation on the P1000. I've read good things about it as well, but unfortunately there aren't enough reviews to include it in this list. This may not indicate poor quality, but it does indicate low market performance - or at the very least, users were too busy to commend the product. Submitted by Jason Horton on Aug. 6, 2016. For anyone who's interested, we do have some Cerwin-Vega products in our music gear database. Submitted by Tom (not verified) on Jul. 9, 2016. Having good bottom end and portability is a rare combination. I'd recommend the QSC K8 as it falls within your weight limit at 27lbs, but it may not have enough low end. The QSC K12 gives you more bottom end but is almost twice as heavy. The QSC K10 is a good in between, and should have enough low end for a jazz trio. Submitted by RichFrets (not verified) on Jul. 9, 2016. For now, there aren't enough reviews of this speaker to make a proper recommendation. Submitted by Ike (not verified) on Jul. 21, 2016. How much did QSC pay you to do this article? Submitted by Jason Horton on Jul. 24, 2016. No one, including QSC, has paid us either to write a guide on a particular topic or to be included in any of our gear guides. At the time of writing Sweetwater is sponsoring this guide - this gives them exposure including their logo and links to their website but they do not determine which products are included as you can see from the fact that not all of the products mentioned are sold by them. Each of the products listed above, apart from the Editor's Pick section, has one of the top 5 Gearank scores in their category of all the powered PA speakers in our database. If you believe there is a powered speaker that should be added to our database then please let us know. Submitted by jason (not verified) on Oct. 25, 2016. Wow please do your research dude. Used to be a EV and JBL fan many years ago but QSC beats EV, jbl and cerwin vega. Used to use vega when I used to DJ back in the day but now I don't even consider them! Submitted by Gerard Brown (not verified) on Jul. 30, 2016. This list is utter crap.....no mention of EV ETX or EKX,QSC KW series....but Mackie Thump and Behringer Eurolive made it? Come on man,this is 2016....Do proper research before compiling a list such as this.....Thank god I don't have to depend on this I fo some one people on here! Submitted by Jason Horton on Jul. 31, 2016. I don't agree with your assessment Gerard, but I can understand why you feel the way you do about this guide because back in January 2016 when we published it, less than 4 weeks after we opened the site to the public, we weren't yet publishing the Methodology section in our guides which points out the selection criteria we used (here's a recent guide with the Methodology section included). At that time the EV ETX and QSC KW series didn't meet the pricing/availability criteria we were using. The EV EKX-12P & EKX-15P did meet the criteria however they simply didn't score high enough to be included at the time - part of the reason was that those speakers were still relatively new and there were very few reliable rating sources available for them back then. If we were to redo this guide today the EKX-12P still wouldn't have high enough ratings to be included, but it's possible the EKX-15P might make the list. Here's a list of all the Powered PA Speakers currently in our public Music Gear Database. For a better understanding of Gearank please see How Gearank Works. OK will check it out. Submitted by Gerard Brown (not verified) on Jul. 31, 2016. Submitted by Steve Bontius (not verified) on Aug. 5, 2016. Curious how the TurboSound I series stack up with the others. Any chance of including them in the ranking? Submitted by Jason Horton on Aug. 5, 2016. Back when we published this guide in January, and again in April when I re-checked, the Turbosound iX range didn't have enough rating/review sources for us to rate them - but the early reports were positive so I made them my Editor's Pick at that time. Personally I'm surprised the iX series hasn't gained more attention because when you consider that most people who have used and rated them have been very positive, they look like fairly good value to me at their current $349 & $449 price points.